VERNON, NY – Jason Barney captured his second consecutive 25-lap Mach 1 Chassis A-Main at the Utica-Rome Speedway with the Lucas Oil Empire Super Sprints. 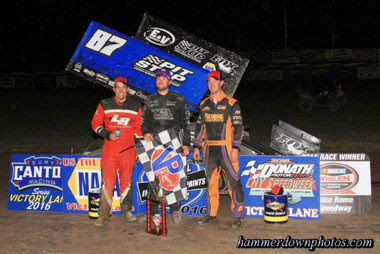 The Brewerton, N.Y., driver dominated Sunday night’s feature. He led the entire distance for his third feature win of the season. Barney pocketed over $2,100 for his triumph in the final night of Donath Motor Worx CNY Speedweek. He gathered points toward the overall series title while also earning valuable points in both the NAPA Auto Parts Tour of the US and the SUNY Canton Racing Series. Steve Poirier finished in the seventh position which was good enough for him to capture the overall CNY Speedweek point title. For the St. Mathieu de Beloeil, Que, driver it was his second consecutive title in the five day event. Barney started in the pole-position with Bryan Howland lining up next to him on the front row. Barney dropped his No. 87 right down to the bottom of the speedway going into the first turn. By using the bottom he was able to shoot away from the rest of the competition. It took Barney very little time to catch cars at the tail of the pack. It was just six laps into the race when Barney was already negotiating slower cars. He stayed true to his line on the bottom of the speedway. Most times the traffic gave way allowing him to stay in his preferred line on the race track. While Barney raced in traffic at the front, Danny Varin challenged and disposed of Howland for the runner-up position. The duo remained first and second as the laps clicked toward the midway point. At halfway it was Barney working hard in traffic with Varin within striking distance. Barney’s car was superb around the bottom. Varin’s car on the other hand was strong right up along the top of the speedway. He closed to within a couple of car-lengths of Barney as the race reached the final third. Barney and Varin battled at the front of the field while Howland and Larry Wight duked it out for the third position. Wight shot around Howland for the spot on lap 17 before Howland went back by him in turns one and two to regain the position a lap later. Varin’s pressure on Barney eventually subsided as he lost ground in the final five laps. Barney was just too much for the Fonda, N.Y., driver as he went on to score the win with his solid efforts in traffic. Varin’s second place finish was his second podium finish of Speedweek. He started the week off at Brewerton Speedway with a second and capped off the week in the very same spot. His car was great on the outside of the speedway until he felt like it just went away. Howland, of Union Springs, N.Y., knew it was going to be tough to challenge Barney from the pole. He worked the top early before moving to the bottom lane. This lane change allowed him to hold off Wight while going on to finish in third. Wight stayed one position behind Howland finishing in fourth with Chuck Hebing round out the top five. Lap Leaders – Barney (1-25). The Lucas Oil Empire Super Sprints are brought to you by: Lucas Oil, Mach 1 Chassis, Einstein Construction Group, SUNY Canton, NAPA Auto Parts, Hoosier Racing Tires, Donath Motorworx, Insinger Performance, Car Mate Trailers, Fondations 4 Saisons, Beard Sewer and Drain, Cobra Coaches, 911 Restoration, Westward Painting Company, Fondations 55, E&V Energy, Panther Frameworx, YorkMont Auctions,, Engler Machine and Tool, Northwood 2 Construction, Brodix Cylinder Heads, Lacaillade Masonry, FX Chevy, ASI Racewear and many, many associate sponsors! !